Along with beards and vinyl records, another forgotten fad from the 1970s that's making a comeback is the lingering threat of thermonuclear bombs. Nuclear war might be back on the agenda once again, but it’s nothing the world hasn’t faced before. During one of the hottest periods of the Cold War, the UK was so paranoid about an attack from the USSR, they drew up a top-secret list of cities and towns they believed were the most “probable nuclear targets”. In 2014, the National Archives released the document to the public for the first time since it was created in 1972. They were even kind enough to also release a map (below) of the potential hit-list to help you avoid being blown to smithereens. 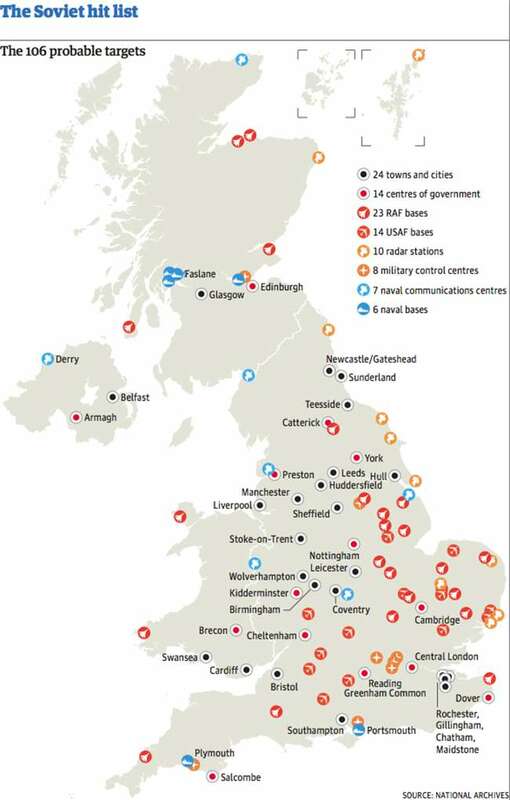 The cities on the list of potential nuclear targets include: Glasgow, Birmingham, Liverpool, Cardiff, Manchester, Southampton, Leeds, Newcastle/Gateshead, Bristol, Sheffield, Swansea, Hull, Teesside, Coventry, Wolverhampton, Leicester, Stoke-on-Trent, Belfast, Huddersfield, Sunderland, Gillingham, Rochester, Chatham, and Maidstone. Along with the 24 civilian towns and cities, the document also cites 14 centers of government, 23 Royal Air Force bases, and over 20 military control and communications facilities. Remarkably, as you might have noticed, central London is only mentioned as a center of government, not a civilian town of importance. Of course, a lot has changed since the 1970s: the world’s geopolitical order has had a big mix-up, nuclear capabilities have become more advanced, and the importance of UK cities has changed dramatically. As a Ministry of Defence spokesperson told The Guardian in 2014: "These are historical records and like many other documents released every year by the National Archives have little or no relevance to the present day." Anyway, let’s just hope those cities have a few nice pubs where we can have a nice cold pint and wait for all this to blow over, just like last time.